For years after receiving Christ as my personal Lord and Savior, I functioned with fearful instead of fearless faith. I prayed for protection and provision with inklings of doubts that raised my levels of anxiety instead of peace. Rather than proclaiming who God is with confidence, I pleaded for affirmation and begged God to give me favor and grant my wishes. Once I stopped treating God like my personal vending machine of pleasure, I began to understand the interdependence of believers and the trustworthiness of God’s sovereignty. I’m so glad the Lord’s answers to my prayers aren’t dependent on my limited vision or fear-filled desperation for personal comfort. In His sovereignty, God knows what I’m going through. He also knows what’s around the corner and what I’ll need to get through an upcoming crisis or over an unsavory obstacle. I don’t. In His goodness, God cares about my needs . . . more than my list of wants. He grieves when I suffer and desires what’s best for me, even when what’s best requires a personal cost physically, emotionally, or mentally. I, on the other hand, usually don’t mind settling for the more feel-good roads of least resistance. It took a while, and I sometimes still forget, that what’s best for me doesn’t always mean what I want or what will make my current situation easier. Even though God is all good, my journey in this world on this side of eternity will often include too much heartache, too much waiting, too much struggling. But the Lord always remains in the know and in control. When God nudges me forward or beckons me to follow, I can trust Him as Promise-Keeper and walk with courageous faith . . . even when I’m fearful. As believers, we have the Spirit of God dwelling in us. He is with us, empowering us, guiding, encouraging, comforting us. He speaks the truth of His Holy Word, assuring us of His proven faithfulness. So, why do we sometimes hesitate when the Lord leads us to do something we’ve always dreamed of doing or something that requires us to depend on His strength because we know we can’t do anything in our own strength? When we know God fights our battles and provides our strength, promising to be with us wherever He leads us, why do we sometimes shy away from risking failure or facing fierce opposition? Because, sadly, our vision is often blurred by our human frailty and we act as if the measure of our faith depends on us. Fear demands absolute proof of provision and protection. Spirit-empowered faith moves forward on the promised assurance of who God is and what He’s declared to be true‒the Bible. Yet, in His goodness, the Lord knows we’re feeble. He’s persistently patient with us. With awe-inspiring kindness, God respects our need to process our emotions and work through the layers of fear, insecurity, and self-sufficiency that prevent us from walking in the power of the Spirit. 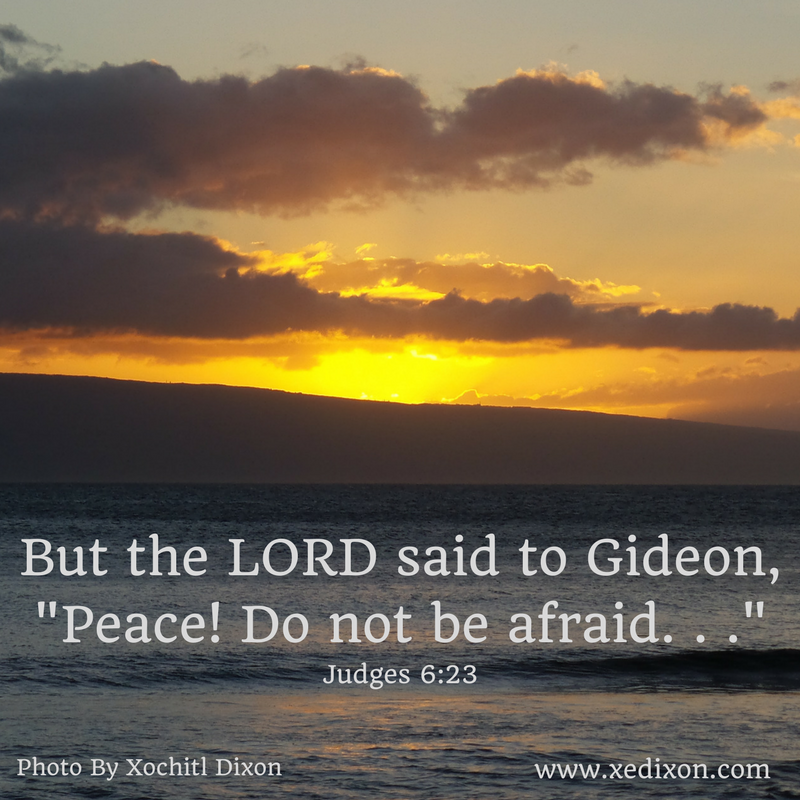 Scripture affirms “the Spirit of the LORD came upon Gideon” (Judges 6:34). This “mighty warrior” had all he needed to follow God with bold confidence. Still, doused in unbelief, Gideon tested God’s honor by questioning His abilities: “If you will save Israel by my hand as you have promised . . .” (v. 36). If? Gideon’s two-lettered badge of faithlessness basically implied God was a liar. The Lord had promised, but Gideon didn’t trust His integrity. In love, God tolerated Gideon’s self-focused insecurities and his vain attempts to surpass faith with fleece-filled litmus tests (v. 37-40). While it may be tempting to judge Gideon and criticize his limp faith-muscles, it’s more than likely that we struggle with the same desires for God to give us confirmation before we step out in faith. Unfortunately, it often feels safer to stand in reluctance, waiting in the pit of disobedience, unwilling to walk in the power we’ve been given through the indwelling of the Holy Spirit. Why? Because, like Gideon, we settle for a perspective distorted by our own imperfections and limitations. God has given us all we need to live brave. As we shift our thoughts to God’s reliability, we can risk rejection and face the possibility of failure. By embracing the power of the Holy Spirit, who dwells in all believers who have surrendered our lives to Jesus, we can abolish fruitless fears and carry a shield of faith molded with the surety of God’s inerrant truth and unchanging character. Mighty King of Kings and loving Father, please help us accept the power You’ve given us to trust You, rely on You, and follow You with fearless faith. In Jesus’s name, Amen. This entry was posted in Blooming in Christ and tagged Encouragement, Spiritual Growth, Trusting God by Xochi E. Dixon. Bookmark the permalink. Amen. It’s sad how long it takes us to “get” this. And even when we do, amnesia can set in and we have to go through the process all over again. Praise God, He isn’t like us. Thank you for your encouragement. You are so right, Colleen. It’s funny how we can get “amnesia” so quickly. It’s a good thing the Lord is loving and patient. I’m grateful we’re on this journey together, Sister. Xochi, you are the bravest person, and one of the wisest that I know. I’m honored to have you as a friend. You are too kind, Janet. Thanks for always being such a wonderful encouragement and a faithful prayer warrior. I look forward to growing with you as we continue to live brave, Sister. I love this line: “I began to understand the interdependence of believers and the trustworthiness of God’s sovereignty.” SCORE!! That encapsulates the whole message in one beautifully-crafted sentence. Thanks for your encouragement, Damon. To God be the glory!